With more and more powerful Smartphones and ubiquity the number of applications available for these devices is growing astoundingly; for both corporate use and entertainment services or mobile marketing. 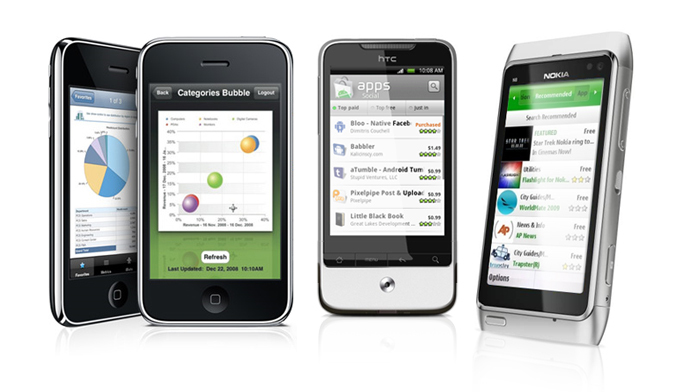 At Imagine800 we make our customers’ ideas become reality by developing applications for operating systems of market-leading SmartPhones, like iPhone, Google Android or Symbian. Besides developing ad hoc applications, we offer an end-to-end service, including the hosting of applications in the server, the dimensioning of equipment and broadband, as well as support and maintenance of the whole system. Our R&D team has developed a multi-terminal platform that identifies the type of mobile phone accessing the contents, giving it the format that is 100% compatiblewith the device. Thus, we have expanded to a great extent our target public, without being exclusively limited to a single terminal. Moreover, we have also developed a content manager; this way our customers need not codify said contents to fit the type of mobile phone. With this manager it is possible to program both canned and live contents. The options are limitless; below are some examples of these applications. Mobile TV with live broadcasts and on-demand contents. Tourism promotional videos about the area where we are. Video surveillance. Access to surveillance, traffic and other types of cameras. Orders Manager. Your commercial reps can check stocks, access price lists, launch orders, etc., at any time and from anywhere in the world. Fleet Tracking. With your SmartPhone’s GPS you will be able to control, in real-time, the whereabouts of a given vechicle of your fleet, optimize routes, and consequently save time and money. Mobile CRM. You will be able to access and process your CRM data anywhere and through any device. Applications that are impacting to enhance your company’s image. Application to keep your customers informed, at all times, about your products, launches, prices, etc.